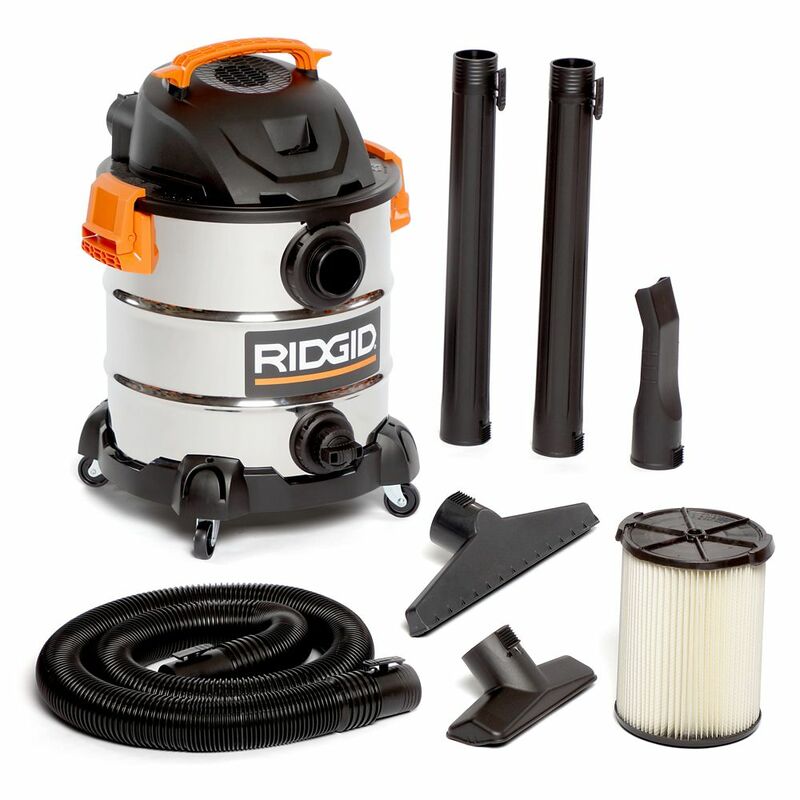 This RIDGID<sup></sup> 37.5 Litre (10 Gallon) Professional Stainless Steel Wet Dry Vacuum is designed to deliver high performance through its 6 peak horsepower motor that easily handles tough clean-up tasks. The rugged stainless steel drum construction provides a professional look, durability, and a high-gloss shine. Our patented Scroll Noise Reduction<sup></sup> technology provides quieter operation by precisely controlling the flow of air through the vac. The built-in drain port makes it easy to empty liquids while the blower port can be used for clearing away sawdust, leaves, and more. The patented tool-less Qwik Lock<sup></sup> Filter Fastening System makes installing or removing your filter quick, easy, and secure. This shop vacuum also features a top handle with an integrated cord wrap, and caster feet with on-board accessory storage. All these features add up to a perfect wet dry vac for Pros, DIYers, and homeowners. Accommodates all RIDGID<sup></sup> 2-1/2 in. (6.4 cm) diameter accessories. Includes VF4000 Standard Cartridge Filter, 2-1/2 in. x 7 ft. Dual-Flex<sup>®</sup> Hose, Two 20.5 in. Extension Wands, Utility Nozzle, Car Nozzle, and Wet Squeegee Nozzle. Powerful 6 peak horsepower motor with patented Scroll Noise Reduction<sup>®</sup> technology provides incredible suction and quieter operation. Rugged stainless steel construction for durability and a high-gloss shine. 15 ft. (4.5 m) power cord provides long reach and wraps conveniently around carry handle for storage. 2-1/2 in. diameter by 7 ft. Dual-Flex<sup>®</sup> Locking Hose resists crimping and collapsing, and adds 180-degree flexibility at both hose ends. Accepts Dust Bag VF3503 (Sold Separately). Accepts Replacement Filters: VF4000, VF5000, VF6000, and VF7000. RIDGID Professional Grade wet/dry vac hose. "Tug-A-Long" feature securely holds hose in place during use. Pro hose is 4 times more durable than the standard RIDGID hose. Consists of extra long 10' x 1-7/8" diameter hose and adapters to fit all RIDGID wet/dry vacs. The 1-7'8" diameter provides both superior flexibility and clog-free performance. RIDGID introduces the GEN5X Brushless 18V Wet/Dry Vacuum. It is the strongest 18V wet/dry hand vacuum in the industry. The Brushless motor delivers maximum runtime, power and an extended motor life. Register this vacuum for the Lifetime Service Agreement within 90 days of purchase and receive FREE Parts. FREE Service. FOR LIFE. 37.5L (10 gal.) 6.0 Peak HP Stainless Steel Wet Dry Vacuum This RIDGID<sup></sup> 37.5 Litre (10 Gallon) Professional Stainless Steel Wet Dry Vacuum is designed to deliver high performance through its 6 peak horsepower motor that easily handles tough clean-up tasks. The rugged stainless steel drum construction provides a professional look, durability, and a high-gloss shine. Our patented Scroll Noise Reduction<sup></sup> technology provides quieter operation by precisely controlling the flow of air through the vac. The built-in drain port makes it easy to empty liquids while the blower port can be used for clearing away sawdust, leaves, and more. The patented tool-less Qwik Lock<sup></sup> Filter Fastening System makes installing or removing your filter quick, easy, and secure. This shop vacuum also features a top handle with an integrated cord wrap, and caster feet with on-board accessory storage. All these features add up to a perfect wet dry vac for Pros, DIYers, and homeowners. Accommodates all RIDGID<sup></sup> 2-1/2 in. (6.4 cm) diameter accessories. 37.5L (10 gal.) 6.0 Peak HP Stainless Steel Wet Dry Vacuum is rated 4.5 out of 5 by 251. Rated 5 out of 5 by Aspeleaf from Bought this unit because of 6 peak hp. I own another Rigid vacuum that I have had 18 years. It is... Bought this unit because of 6 peak hp. I own another Rigid vacuum that I have had 18 years. It is a 16 gal 6.5 hp. Great machine but a little big for carting in and out of houses. This vacuum performs well, it is light and much easier to get down a hallway. Rated 4 out of 5 by Jamie from Tha vacuum works great and will do well with my... Tha vacuum works great and will do well with my line of work. Rated 1 out of 5 by usedtolikeridgid from Do not buy this product. The tank is made of a stainless steel but the hardware used to connect t... Do not buy this product. The tank is made of a stainless steel but the hardware used to connect the drain, handles, and inlet are regular steel and immediately begin to rust if used for water pickup. Same is true for the welded seam of the drum. After contacting Ridgid, they claimed that I mis-used the product and would not warranty their design/manufacturing defect. If picking up water is mis-use, then it should not be sold as a wet vac. Rated 5 out of 5 by Renee from It is an excellent shop vac. I use a bag insert to collect debris while using it & it is very cl... It is an excellent shop vac. I use a bag insert to collect debris while using it & it is very clean with no dust output!! Highly recommend this product!